After a week of noticing this odd cramping in my pelvis I was informed yesterday that it was actually my BABY that I was feeling. I am such an idiot (it seems). All the books and articles I’ve read kept telling me that it would feel like a “fluttering” or “tapping” … but that is NOT what it feels like. I guess, if I were to put it in my own words I would say that it feels like there is a little trapped bird inside me that is rolling around a very tight space, and pushing on my insides. “Fluttering” makes it seem like a delicate sensation that is almost easy to overlook … but in actuality, there is nothing subtle or delicate about it. It feels like something moving inside of you. And, if truth be told, it doesn’t necessarily feel good, nor does it exactly hurt. My baby likes to do its calisthenics in the late evening hours, so I usually encounter the tumbling in my belly as I’m doing my own tossing and turning, trying to fall asleep at night. I do enjoy the feeling, and look forward to it each day, but I still think it’s important to NOT mislead the public: the quickening sensation does not feel “good” … just “different”. I would miss it if it ceased though … and of course, I don’t want it to stop. Feeling SOMETHING is reassurance that all is well in utero. In other baby news, we have less than 20 days to go before finding out the gender of this little Doozer, and I am ready to crawl out of my skin in anticipation! I am also incredibly jealous of Dawn, who someone finagled her way into finding out the gender of her little peanut at FOURTEEN weeks!! Oh, I don’t think she has any idea how lucky she is. While I’m stuck in “baby planning pergatory” she has already selected the style to use in her nursery decorating. Oh, the unfairness!! But, I guess I should congratulate her instead of wallow in my own misery. Moving on. Each day I feel like I’m getting bigger and bigger. I’ve gained approximately 12 pounds so far in the pregnancy. 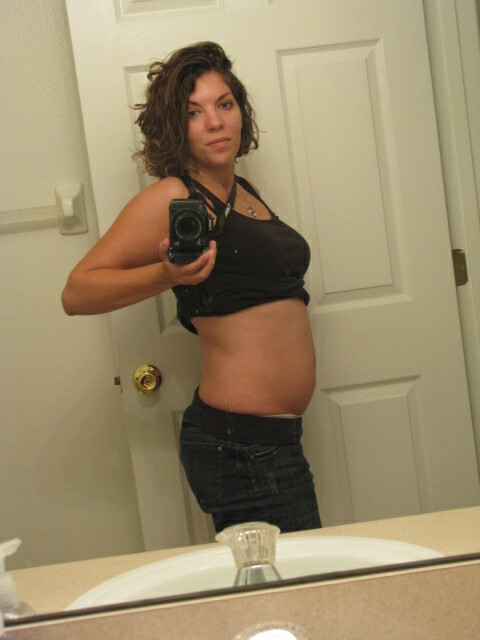 But, I just took a few pictures of my profile and my bump isn’t as tell-tale as I suspected. Odd, isn’t it? I just appear to be a little more frumpy than usual – not pregnant. What do you think? In preparation for all the upcoming festivities, I have decided that our baby will grow up with the wholesome entertainment of Jim Henson. Therefore, I’ve burned the series of Muppet movies, and last week rented the first season of “Fraggle Rock” in preparation. Oh, how I loved that show as a kid, and now after catching back up with the series I have decided that my kids will love it too (or else!) 🙂 I mean, it’s got all the elements of good kid entertainment – music, colors, funny voices, adventure, and slap stick comedy. Plus, I just LOVE the creativity of Jim Henson. Are you with me on this? Holla if you feel it also! This entry was posted on Saturday, May 15th, 2010 at 12:33 am and is filed under Baby!. You can follow any responses to this entry through the RSS 2.0 feed. You can leave a response, or trackback from your own site.